Chanting Mantra together and holy text of the "Bhagavat Gita"
We are waiting for you to rejoice in an oasis of peace for people interested in spirituality, simple life and high thinking. We will sing and dance, we will listen to what the Lord Krisna teaches in the "Bhagavad Gita" and we will talk about it. The party will end with a delicious vegetarian and sanctified dinner offer and everyone! Sunday party (including dinner) is free but you can leave a free offer to the temple. ProgramProtected content Krishna mantra, also referred to reverentially as the Maha Mantra ("Great Mantra"), is a 16-word mantra, composed of two Sanskrit names of the Supreme Being, "Krishna," and "Rama. One's original consciousness and goal of life is pure love of the god Krishna. 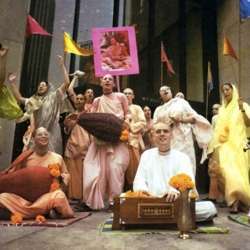 Since the Protected content , the mantra has been made well known outside India by A. C. Bhaktivedanta Swami Prabhupada and his movement, International Society for Krishna Consciousness (commonly known as "the Hare Krishnas"). The Bhagavad Gita is a Protected content Sanskrit scripture, the most important Indian holy text. It is the dialoge between God and the human being who needs answers about what is life. The Krishna-Arjuna dialogue covers a broad range of spiritual topics, touching upon ethical dilemmas and philosophical issues that go far beyond the war Arjuna faces. Questo canto può essere paragonato al pianto sincero di un bambino che chiama la madre. e Lui Si rivela a quel devoto che canta questo mantra con sentimenti sinceri.